The Aidis Trust are a national charity who provide people with disabilities with computer advice, information, assessments and equipment. The A-T Society work in collaboration with the Aidis Trust to provide IT equipment. 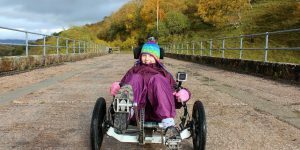 The Motability Scheme enables disabled people to exchange either their Higher Rate Mobility Component of Disability Living Allowance or their War Pensioners’ Mobility Supplement to obtain a new car, powered wheelchair or scooter. Make a Wish is a national organisation that provides children with life threatening conditions the opportunity to have their wishes granted, for example going to ‘Disney land’ or meeting a celebrity. 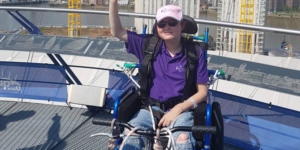 The Willow Foundation is the only national charity that provides psychological and emotional support for seriously ill 16 to 40 year olds through the provision of special day experiences. Natspec is the membership association for independent specialist colleges providing further education for young people with learning difficulties and/or disabilities. You can search the website for appropriate colleges. Set up in 2012 by the Read family in the name of their daughter Evie, who has A-T, Action for A-T primarily raises money to support research to find a cure. This is a group of families spread across the country which is starting to build relationships with professionals and build a presence. A.P.R.A.T is an important source of support to people in France and in other French-speaking countries. They have very good links with other A-T organisations. Israel has a higher than expected number of people with A-T, as the gene is common in one area of the country. The Association works closely with professionals at the specialist A-T clinic. Relaunched in 2016, this organisation is bringing together a number of smaller organisations to speak up for people living with AT in Italy. The ATCP was set up by Brad Margus when his sons were diagnosed with A-T. They helped establish the A-T clinic in Baltimore and raise a lot of money for A-T research. This is the biggest A-T organisation in the world. Once known as the Friedreichs Ataxia Society of Ireland (FASI), Ataxia Ireland supports people with all the ataxias including A-T. Taking its name from Bradey and Ashleigh, her two children with A-T, BrAshA-T is run by Krissie Roebig. Having established an excellent A-T clinic in Brisbane, the organisation now funds a lot of research as well as supporting people living with A-T all over Australia. This is a large organisation dealing with all the different forms of Ataxia, but it does not have that many members with A-T at the moment. However the contact for A-T, Hermann Stimm, is very active. Hajar deals with all primary immune conditions but its general secretary, Bouchra Benhayoun, is the mother of a girl with A-T and is in touch with quite a few families. This is a new group set up in Brazil. Their site gives access to information and videos in Portuguese. This group is active and organises regular meetings for families living with A-T. This is a small organisation, based in the south of the Netherlands, which divides its activities between providing information, raising funds for research and raising awareness.